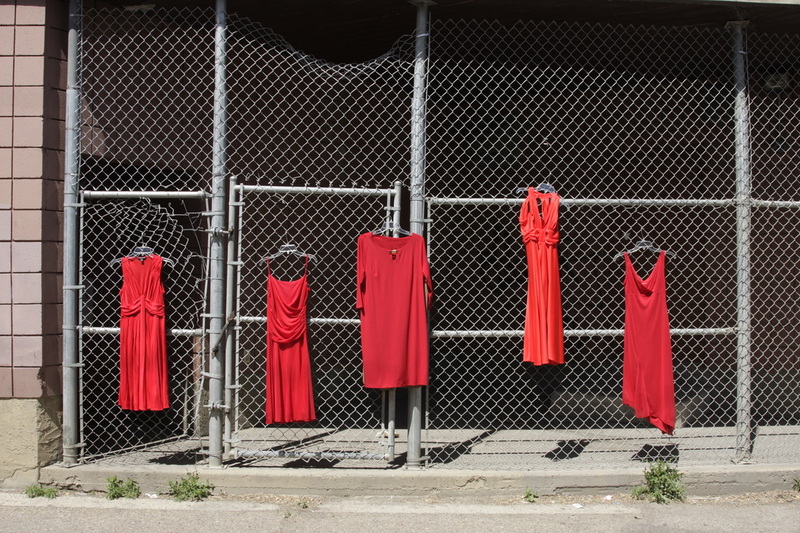 The REDress Project, inspired by the exhibits of artist Jaime Black, aims to raise awareness of the social issues around missing and murdered Aboriginal women. 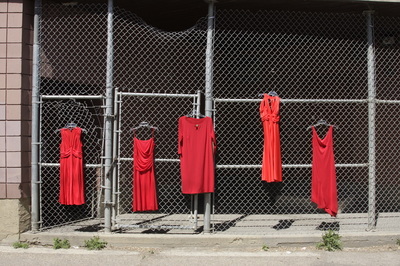 "My current work: The REDress Project, focuses around the issue of missing or murdered Aboriginal women across Canada. 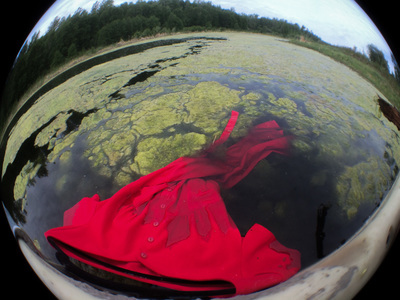 It is an installation art project based on an aesthetic response to this critical national issue. 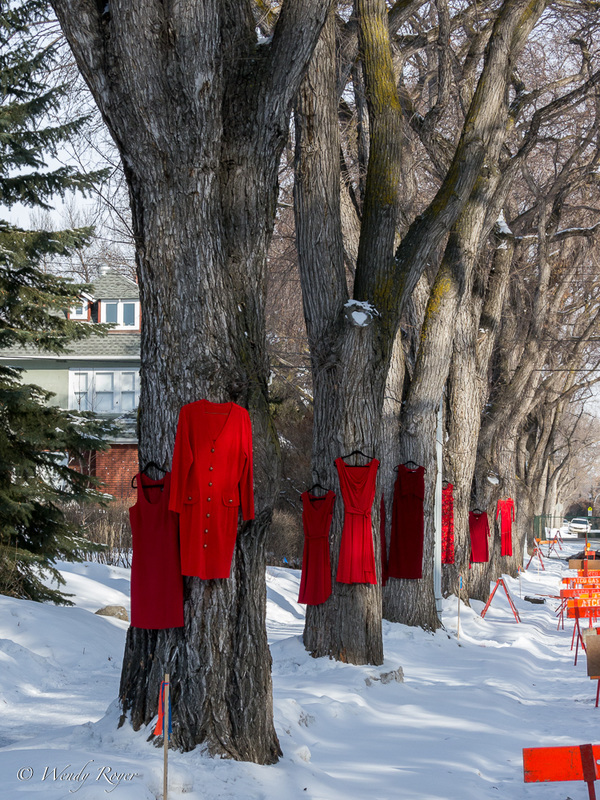 The project seeks to collect 600 red dresses by community donation that will later be installed in public spaces throughout Winnipeg and across Canada as a visual reminder of the staggering number of women who are no longer with us. 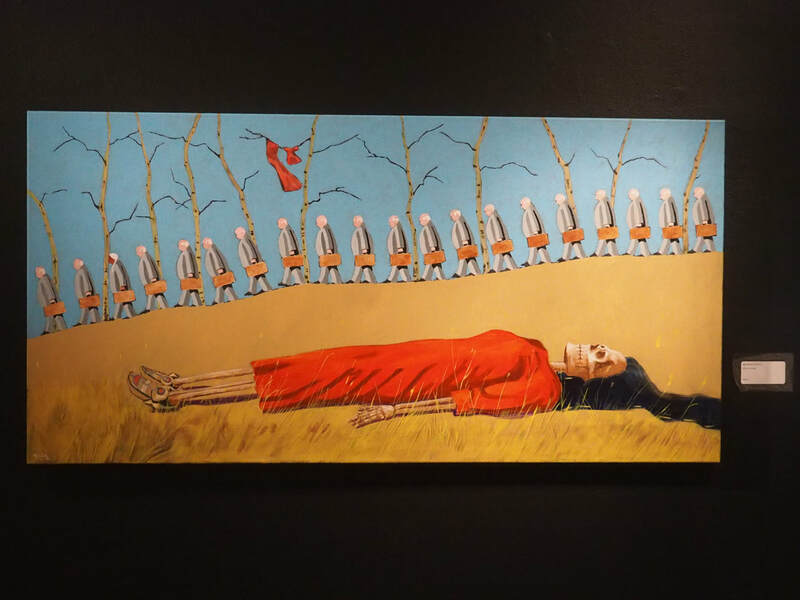 Through the installation I hope to draw attention to the gendered and racialized nature of violent crimes against Aboriginal women and to evoke a presence through the marking of absence." 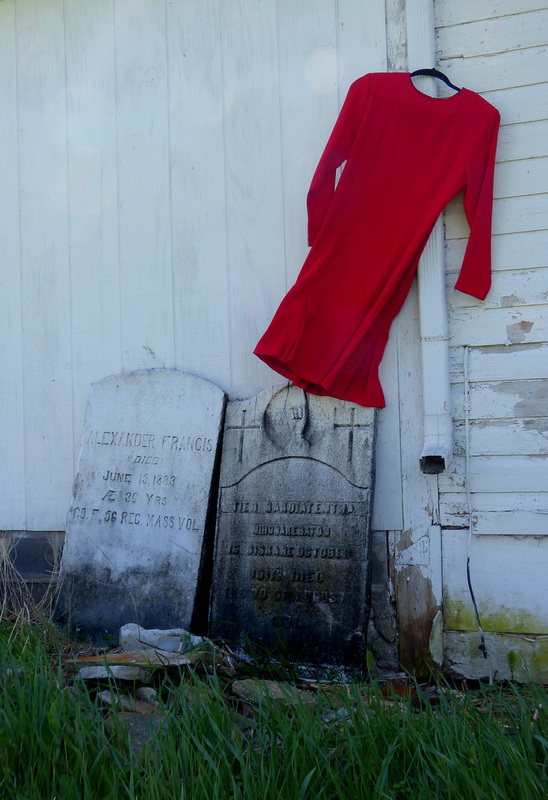 ​​Numerous IACC members have been taking photographs of red dresses since January 2015 to honour the memory of 1,181 Missing and Murdered Indigenous Women. ​We have now 181 photographs on 10 composite boards and 77 individual enlarged images in our collection. 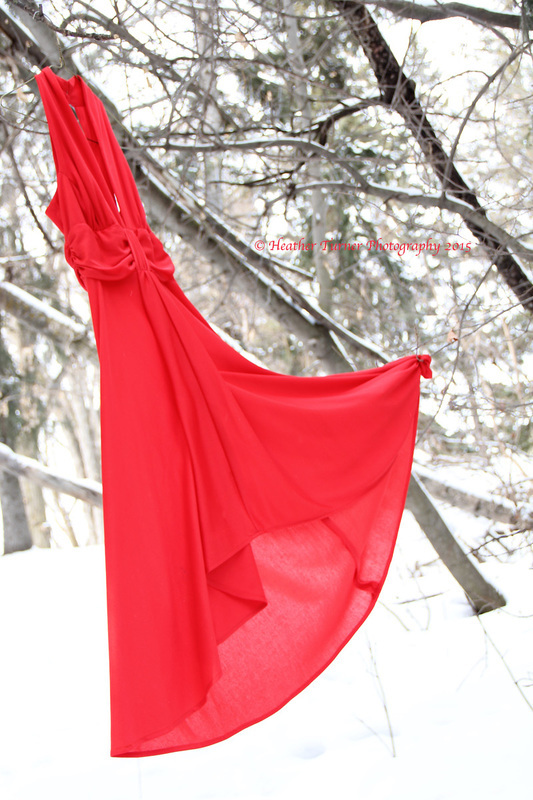 That means 258 printed photographs of red dresses in total. There are many, many, more on our website. Article about Mufty's trip to the Human Rights Museum in Winnipeg. The Ripples of Loss works are a vivid visual departure from Terry McCue’s previous practice. After an exchange with an artist friend (Mufty Mathewson), McCue became compelled to paint these intense, brilliantly coloured images to raise awareness about the missing and murdered Aboriginal Women of Canada. The resulting sombre and striking works emit the ghostly forms of the women dressed in red in an ever-changing landscape. McCue reveals the women in traditional aboriginal ceremonial attire: Ojibwa Jingle Dance dresses, Plains Cree tunics and cloaks. The skeletons of their spirit animals accompany them—sometimes leading the way, facing the incoming storm. The Sage Awards, presented by Servus Credit Union, recognize and celebrate the contributions and achievements of seniors in Greater Edmonton. Be inspired by seniors who work tirelessly to make our community, province, nation and world a better place to live, work and play. ​Mufty Mathewson’s lifelong passion has been storytelling and capturing life in her photography. 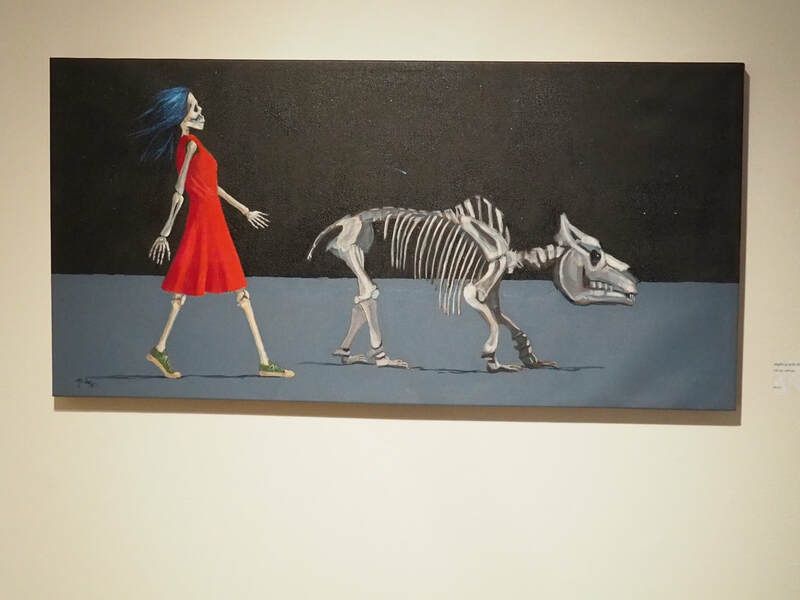 She raises awareness about social issues, vulnerable populations and overcoming disability through her artistic talent, passion, and compassion. As a born leader, Mrs. Mathewson has been inspiring others with her energy, creativity, broad-reaching interests, skills, and sensitivity around many of her passions. She sees unexpected opportunities to use photography to educate and capture fleeting moments or to create commissioned portfolios of work. Mrs. Mathewson uses her talents to improve the lives of others and make an imprint for social change. 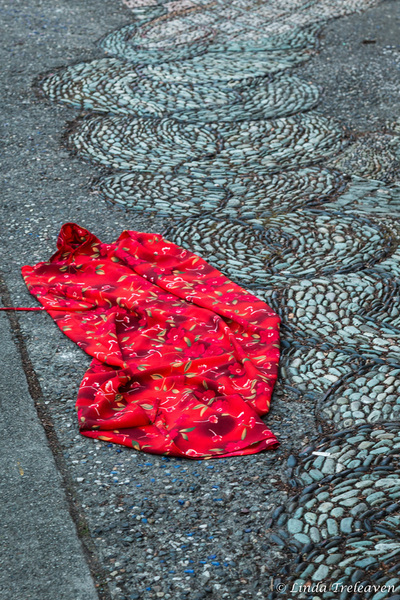 Her latest project is the REDress Photography Project, raising awareness for the 1,181 Murdered and Missing Indigenous Women. The impacts of her contributions have been felt locally, provincially, and internationally. Mufty Mathewson leads by example with profound sensitivity to the needs of others. Using photography, Mufty captures and celebrates life.